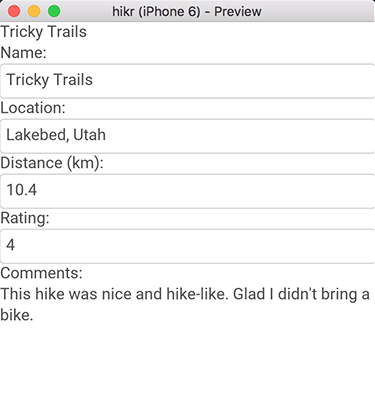 In this first part of the tutorial, we're going to start fleshing out the first view of our app; the Edit Hike view. This view will display and allow us to edit the data for a single hike. This means we'll be building both the view, which represents the visual components we'll interact with, and its view model, which represents the editable data that's presented by the view. These two files are all it takes to build a Fuse app! MainView.ux will contain the UX code for the top-level view of our app, and hikr.unoproj will contain various project settings. Everything we'll be covering in this chapter will happen inside MainView.ux. Remember that we can also start previews on our devices, and now's a pretty good time to do so. See our Preview and Export guide for info on how to get those up and running. Now that we've got our project and our previews are up and running, it's time to start displaying things and fleshing out our data model. We won't worry about setting up the different pages in our app or anything just yet - that comes later. For now, we'll start by simply displaying some text. As we can see, it's just an empty App tag, representing a clean slate for us to start working on. Also note that in UX, tags are case-sensitive; App is different than app, for example. At this point, we'll save MainView.ux, and immediately, our various previews will update, showing our changes! When working with Fuse, it's recommended to save often, as this can help catch errors and typos immediately, instead of having them pile up and dealing with them later on down the line. A ClientPanel is really just a container that will reserve space at the top and bottom of the screen for various OS-specific visuals, which is perfect in our case. What we're going to do is add a TextBox to our UI. TextBox represents a simple single-line text input field with basic styling, which is perfect for editing name in our case. But first, we'll need to ensure that when our TextBox edits name's value, the rest of the UI can be notified of this change. In other words, we need to make sure that this variable can be observed - and this is what FuseJS' Observable is for. Now, name is an Observable instead of a regular variable. This means that any changes to it can be observed by the UI or any other subscribers the Observable has. And when we databind to an Observable, this is exactly what happens - Fuse takes care of all the plumbing necessary to ensure that when an Observable's value is changed, the UI will update accordingly. Awesome! Now, when we save this, we'll have both a Text and a TextBox element displaying the value of our name Observable. And when we edit the contents of the TextBox, we can see that the Text's value also changes! This is because databinding to TextBox's value property gives us a two-way databinding, which means that not only will the UI update to display incoming values, but it can make changes to these values as well. Notice how we've also added InputHints to the TextBox's that will modify numeric data. This is a small improvement that will ensure a more appropriate numeric keyboard will come up when editing these fields on iOS and Android. At this point, we should have a fully-working editor for all of our values. Sweet! While we're at it, let's make a couple additional improvements. As we can see, there's a bit too much text to fit on just this one line. It would be much nicer if this editor showed all of the text and allowed us to insert multiple lines for this field. This gives us exactly what we were after - a multi-line editor with text wrapping displaying all of the text in the field. Of course, it's a bit hard to see, but we'll fix that in a later chapter about styling. For now, let's just continue to focus on blocking out the major parts of our app. This will allow us to scroll the form up/down as necessary in order to edit the fields we want. Great! Of course, this view only displays one hike, and what we're after is a list of hikes we can display/modify. In the next chapter, we'll expand on what we've built so far by introducing multiple hikes and the ability to select one to display and edit. So when you're ready to go, let's dive in!